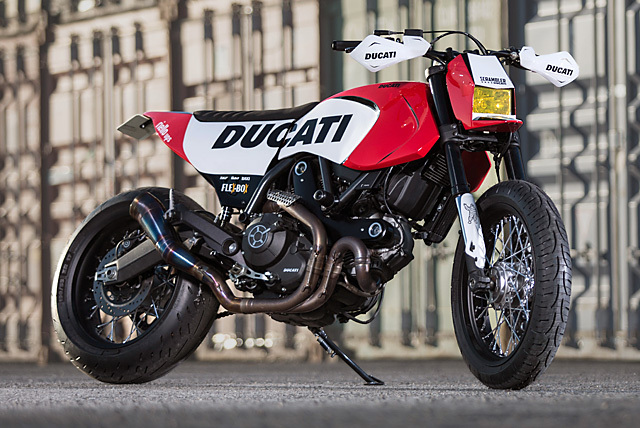 “We received a call from Ducati Spain in March 2016. We were selected to be part of this project with two other Spanish builders. Each one received a Scrambler Icon and could do modifications, with the rule that the bike should be able to ride in Spanish roads, so street legal.” With WDW just four months away Eduardo started drawing sketches before the bike had even arrived and was making plans so that work could commence the second the Scrambler was delivered. With the new Ducati unwrapped and fuelled up it was taken for its maiden voyage and immediately Ed knew all plans had to be thrown out the window. 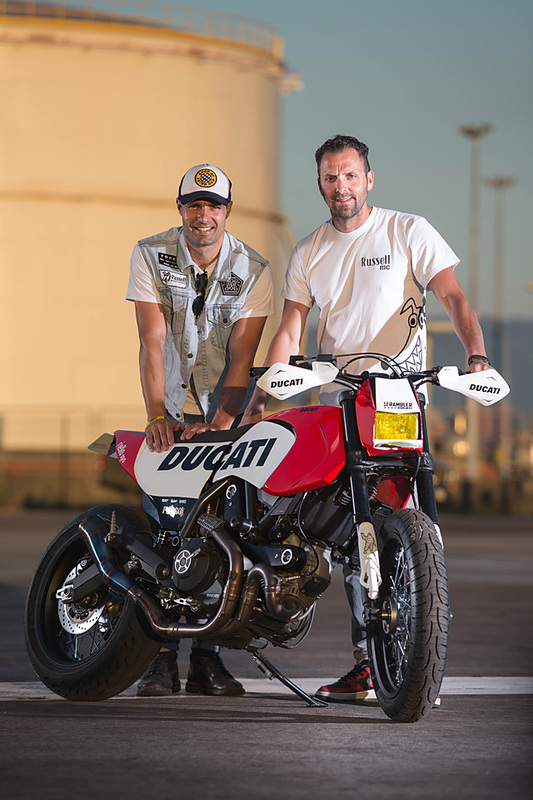 The team are big fans of Supermotards and having built plenty of them knew exactly what they were getting themselves in for. 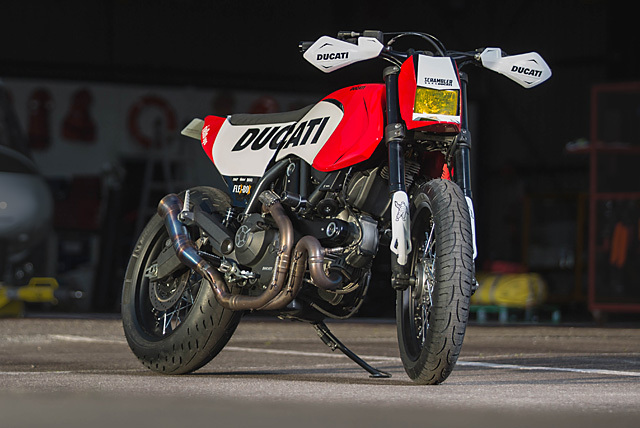 Not only did it give them a chance to steer away from the Cafe Racers and Tracker builds most Scramblers have been treated to but it was also a chance to pay homage to one of Ducati’s finest street weapons, the Hypermotard. With that settled the brand new bike was dismantled at a rapid pace, tank, seat, exhaust and all kinds of bracketry removed so a bare canvas was gazing back at them. From here they could envision the slim lines of a Motard and start to lay out a design. The rear of the frame was cut off and a new design fabricated that would support the seat to come and be more in line with the overall look of the bike. To get the shapes right Eduardo follows the path of Tamburini and Terblanche before him in designing his bikes and a full-scale clay mould was sculpted until the shapes were just right. The entire fibreglass bodywork is just two pieces with the convergence where the seat meets the tank at the mid-section of the frame. A single piece wasn’t possible as the bottom section of the factory tank is retained so as to utilise the in-tank pump and regulator that the fuel injected bike requires to run. 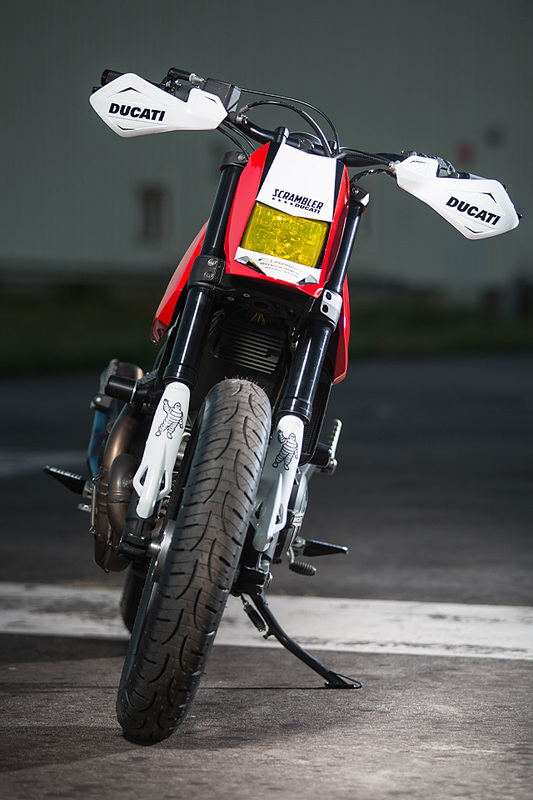 With the two major pieces of glass work complete there were still the extra elements needed to truly capture the Motard look. The headlight took three goes before everyone was happy with the way it sat and the rectangular yellow lensed light is housed in a steel piece that also has an integrated front guard just like the Hypermotard. Back to the itchy glass work and lower fork leg guards give the front on view the perfect touch and are rounded out with a set of stark white bark busters. 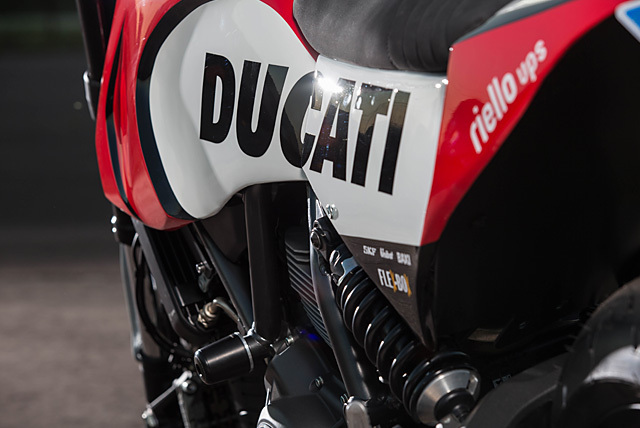 The remainder of the paint is a tip of the hat to Ducati Corse, the racing division of the Bologna factory in the famous Marlboro livery. “For the colours, we decided to go for Ducati MotoGP and Superbike inspiration as we decided the bike was going to be a Street racer.” The Ducati Corse red and stark white colour combination is broken up by a large Ducati logo in black on each side and the decals of some of the race teams minor sponsors on the rear quarters. 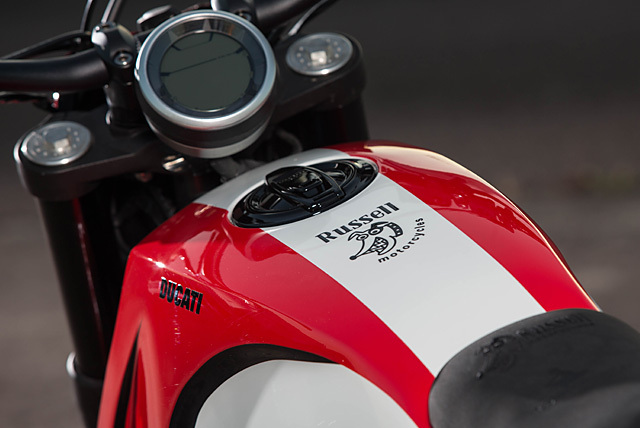 With the finishing touch, the Russell Motorcycles logo on the top of the tank which features a cartoon version of the real life workshop mascot, Paco, the Jack Russell. The standard engine has been left relatively untouched, with the 803cc L-Twin Desmodromic 2 valve providing plenty of torque for fun in the urban environment. The factory catalytic convertor is a real power zapper, so while the standard headers remain, it’s been tossed in the bin and the rear section replaced with a one-off stainless steel silencer to give the Motard the bark to match its bite. 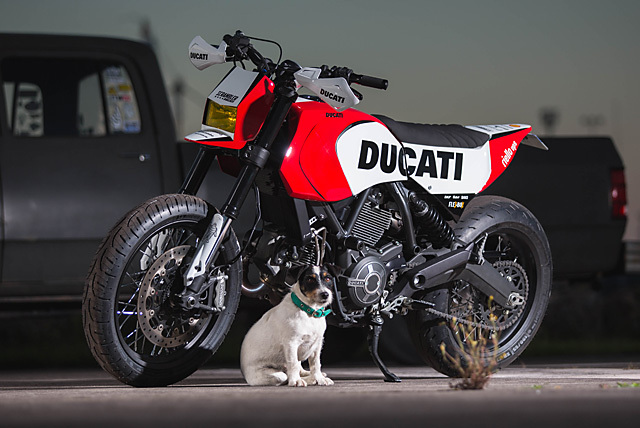 The Magnetti Marelli ECU is one of the few factory units that responds well to the removal of the catalyst and the freeing up of the exhaust tract and combined with the lower weight ensure the Scrambler is as fast, agile and active as little Paco is tearing around the workshop. The one sacrifice that had to be made to ensure the factory fuel injection system operated properly with the retaining of the lower section of the fuel tank is a loss of 2 litres of fuel capacity, but with over 11 litres still on board that’s more than enough for such a wild ride. 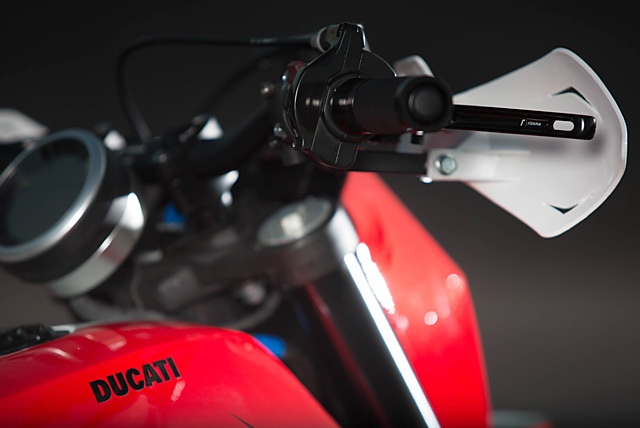 The standard upside down Kayaba 41mm forks remain in place but allowing better leverage to fling the little Ducati around a set of Rizoma tapered bars have been fitted up. These are clamped by new risers also from Rizoma with a brushed aluminium gauge holder that keeps the standard instrumentation in place. More pieces from the new range of Scrambler products from Rizoma were ordered with the Street pegs, adjustable levers and the B-Pro engine guards also fitted up for those moments you push just a little too hard. With high quality components for the rider’s hands and feet sorted out a new seat to match the body work had to be completed. 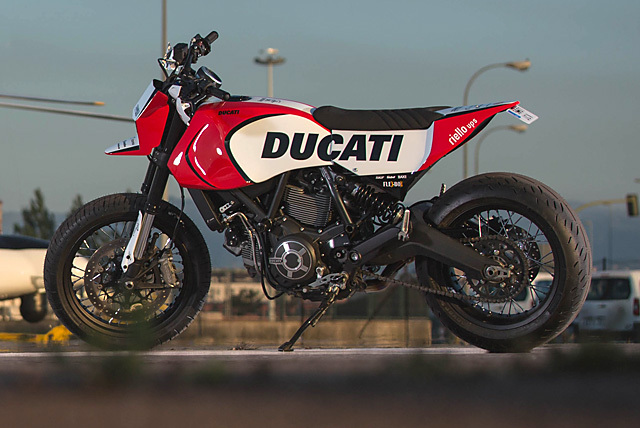 In true Motard style it’s high, flat and extends up onto the tank so the rider can get their weight over the bars and with neatly embossed logos it looks a treat too. Ducati are paying us for this, yeah? 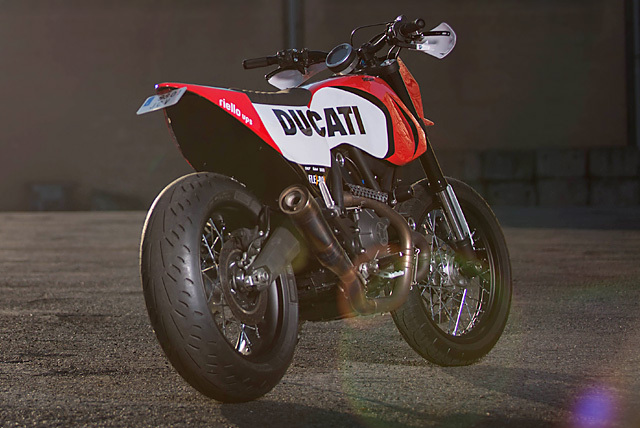 To finish off the build Eduardo had a new set of competition rims laced up to Ducati hubs that do away with the standard Ducati alloy rims and wrapped in sticky Michelin rubber means there is no shortage of grip. With such a small period of time to work in, wanting to make a huge impression and building a new bike into a design not yet attempted meant that Russell Motorcycles had to choose their modifications and dollar spend wisely. For the trip from their home in Asturias, North West Spain, across France and into Italy the bike was bubble wrapped to within an inch of its life and then covered in cardboard to ensure a safe journey. Arriving at WDW with Scrambler’s dotted all over the place the decision to go in the Supermotard direction was rewarded with a standout build that captures the heart of the Ducatisti, “We are very proud and happy with the bike and the way it turned out.” Now all that is left to do is unleash the throttle on the hard charging tarmac terrier and see how long it takes before little Paco gives up and heads for home.